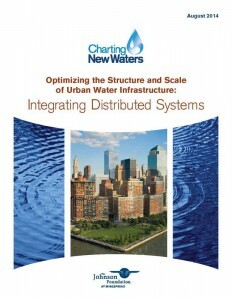 On Aug. 21, The Johnson Foundation at Wingspread, as part of its Charting New Waters initiative, released a report on integrating distributed systems into urban water infrastructure. While centralized water infrastructure has long provided solutions for drinking water, wastewater, and stormwater, technological developments along with sustainability and resiliency efforts are drawing attention to distributed systems. These systems can be complementary to centralized infrastructure, and may in some cases, be able to replace it. Distributed systems are located at or near the point of use and can be more or less connected to the centralized system. Some distributed systems service individual homes or entire communities, and they can be found in rural or urban settings. Green infrastructure provides increasingly common examples of distributed systems, and can help cities improve resiliency to climate change and extreme weather. This report is based on a March 2014 meeting hosted by The Johnson Foundation at Wingspread in conjunction with the Water Environment Federation and the Patel College of Global Sustainability at the University of South Florida. These groups convened a diverse group of experts to examine the potential for distributed water infrastructure systems to be integrated with or substituted for more traditional water infrastructure. The focus was on right-sizing structures and system scales and services to optimize water, energy, and sanitation management while achieving long-term sustainability and resilience. Also as part of its Charting New Waters efforts, The Johnson Foundation at Wingspread released another report Aug. 28 focusing on New Jersey’s water infrastructure challenges. The report “Developing an Agenda for Change for New Jersey’s Urban Water Infrastructure,” discusses how the state can transform its communities while also addressing combined sewer overflows. It outlines a set of recommended priority action steps, and calls on public, private, and nongovernmental partners to ensure necessary investments are made to design, construct, and maintain infrastructure that strengthens cities, enables economic growth, and leverages modern practices.